Earlier this year we featured the author Edward Glover here on the Norfolkinworldwar1 site as he told us a little about the dedication he placed at the start of his newest book – A Motif of Seasons. 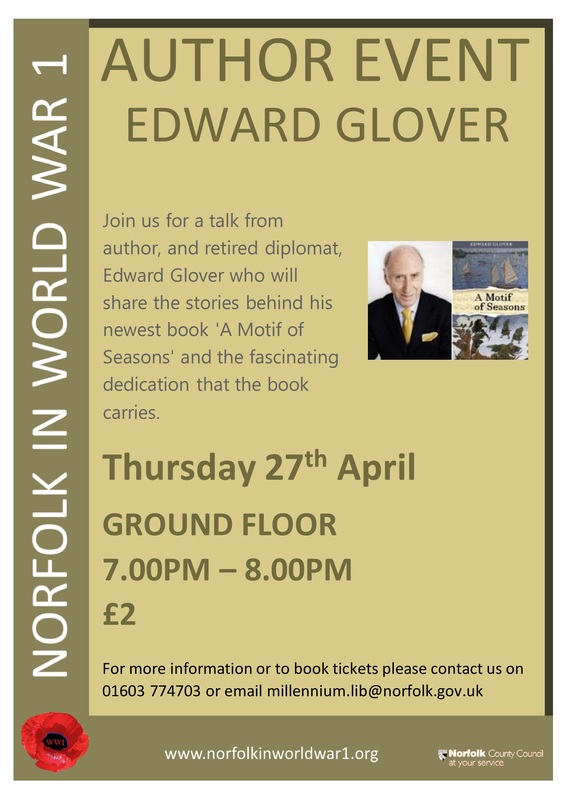 We are really pleased to say that Edward has agreed to give a talk about his writing and also more about this dedication at the Norfolk and Norwich Millennium Library. The event will take place on 27th April at 7pm and tickets are just £2. This event coincides with the Forum’s Finding the Fallen exhibition about the Battle of Gaza so why not plan some time to look around that as well before the talk? To book tickets please call 01603 774703 or email millennium.lib@norfolk.gov.uk. This entry was posted in Events and tagged author talk, novel, WW1. Bookmark the permalink.